What do the Rio Olympics have to do with artificial turf? If you had the chance to watch the sport of field hockey on television, you would have seen the beautiful artificial turf that the Rio Olympic Committee installed. But like many, I didn’t know anything about the sport. Or why so many sports arenas and play areas have changed over to plastic grass. However, after watching a few games and hearing how this faux lawn improves the sport, I realized why so many people had made the switch with the help from artificial turf experts like Watersavers Turf. All Olympic and World Cup tournaments for field hockey require the teams to play on synthetic grass. The rule has been a requirement of the Olympic Committee since the Olympic Games in Montreal, Canada in 1976. The Montreal Games were played on synthetic grass so that there was – literally – a level playing field! So why did the International Olympic Committee decide that synthetic grass needed to be a requirement for all international games? To understand that, we need to know just what this sport is all about. 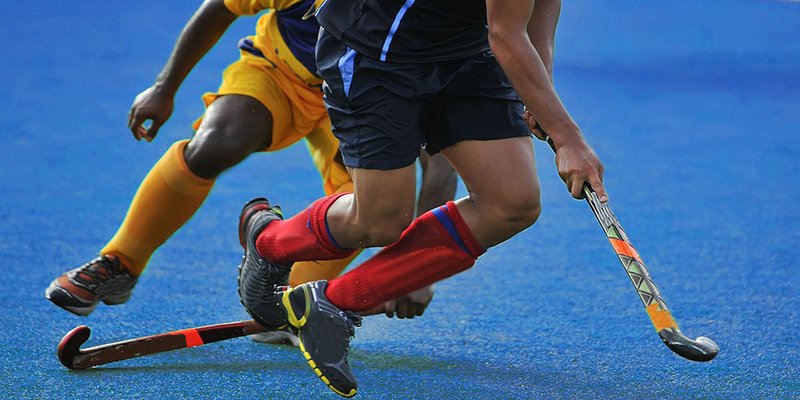 Field hockey is a very fast-paced game played on a rectangular area called a “hockey pitch” or just “pitch.” In the Rio games, this pitch is bright blue with lime green at the edges. The lines on the pitch are white, and the game uses a yellow ball. For the Rio games, the colors used for the pitches are the colors of the Brazilian flag. Nice planning! So what is this sport? Think ice hockey played on a pitch instead of ice. Players run down the field, hitting the ball with only one side of their stick and scoring goals by putting the ball between the goal posts. Players run about five miles during an event. The game is quick, fast and exciting to begin with but adding the synthetic turf makes the game even quicker and faster. With the artificial surface, the pitch is flat. There are no divots, bumps or ruts that would change the direction of the ball or cause delays. The action is non-stop. An added benefit of installing artificial grass is that teams can play multiple games without destroying the lawn or spending lots of money to fix it. Henry Weir, one of Great Britain’s field hockey defenders, had this to say about the bright blue grass at the Rio Games, “I like playing the blue pitch. It’s got more of a ‘wow’ factor. It’s very Rio, and it’s very flash.” He went on to state that the pitch plays very fast. So Why Synthetic Pitches for Field Hockey? Remember that the synthetic pitch is flat without any divots, ruts, or holes. It’s safer for the players. It reduces tripping injuries. It speeds up the action. The ball glides on the surface just like a hockey puck does on the ice. Games are played in “rounds.” Several games are played on the same pitch over a short period during a tournament. There is no real maintenance. So, the cost of care is much lower than a real grass field. As a bonus, there is more playing time on the artificial pitch. The color of the pitch doesn’t always have to be green as the Rio Games show. According to the Olympic Committee rules, the color can be green, signal blue, or ultramarine blue. Teams may select any color for the outside border. The London 2012 Olympic used signal blue on their pitches to make the ball stand out. The bright color allowed viewers to see the ball better than on a green field. Since then, many stadiums have picked the blue turf for their practice fields and playing surfaces. New Zealand just installed a blue pitch for their practice area and stadium. The American field hockey teams did well at Rio and enjoyed their time playing safely on the synthetic pitch. However, you don’t have to be a pro to enjoy the benefits of plastic lawn. If you have any questions about making the switch from real grass, speak to the expert staff at one of our seven Watersavers Turf locations. You can chat with us online 24/7 or call 844-974-8873. You can also ask for a free estimate online. We are always happy to help; whenever and wherever you need us.